Today is the start of a new category which I will update weekly until I run out of material. Trust me, I have a lot of material! As I said in my previous post about Mr Capewell’s fantastic collection of glass negatives, my Dad did yard work to help out an elderly neighbor who happened to be one of Capewell’s relatives. She offered Dad several boxes of tobacco cards, ephemera and a bunch of glass negatives in boxes, brown bags and whatever would hold them! She was getting up in years and didn’t know what to do with all of this “old junk” so Dad ended up with it. Dad declared that he had a daughter-in-law who loved antiques so we ended up with it. The stuff sat at my house for about ten years until I decided to take a look at what may be on those old, 5″ x 7″, glass negatives. Unfortunately, they wouldn’t work with my scanner being that the backlight is too small so I developed a work-around. I taped out a position on a lightbox and locked a digital camera down on a tripod above it. I lay the negatives on the box and shot digital photos. I inverted and cropped the image in Photoshop. Then I adjusted the Levels and eliminated some dust here and there. st shot in the post is the finished item. 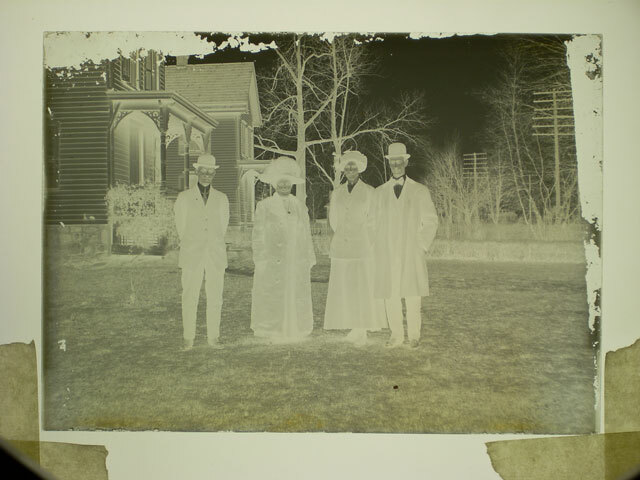 Below is a detail shot showing our well-dressed foursome posing for the camera in a yard that is definitely in Southern New Jersey and probably in the town of Westville. They may have been headed to the theater in Philadelphia which was just across the Delaware. There was a number of old theater programs among the ephemera that came along with the negatives. Henry appears in a number of these negatives, but I think he is behind the camera on this one. I have about 200 of these glass negatives which I have shot, and I plan on posting them all. Stay tuned!!! 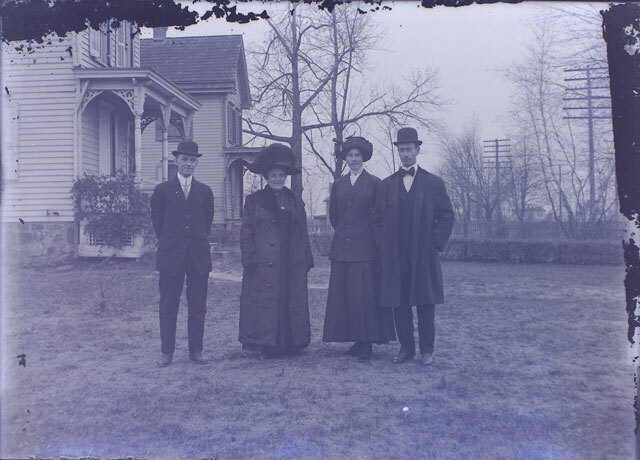 This entry was posted in The Capewell Glass Negative Collection, The Henry Capewell Glass Negative Collection and tagged 1900, 1910, antique, glass negative, Henry Capewell, New Jersey, Westville. Bookmark the permalink. This is amazing! What a fantastic find! I am really looking forward to seeing more of this collection. Thanks so much for checking out the site and commenting! I have about 200 glass negatives and various pieces of memorabilia that I will be posting once a week. It will probably be Thursdays so stay tuned!!! 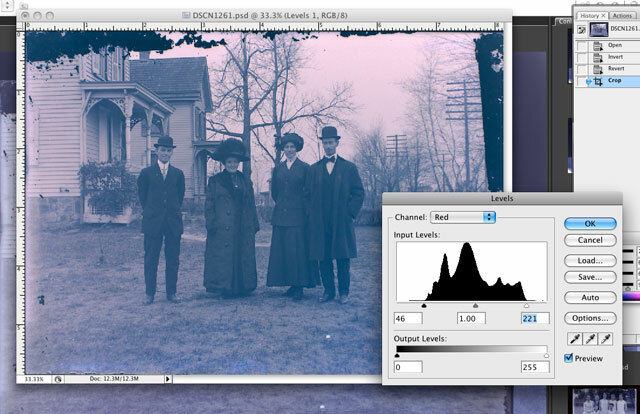 You are starting to fall under the spell of glass negatives. I am entirely hooked on them, as you can see by my simple website, http://www.fauxtoart.com (where nothing is for sale). I collect antique glass and a few film negatives, digitize them as you do, then colorize some of them. Many of the old black and whites should remain black and white, but colorizing a select few has been a great hobby for me. I look forward to seeing more of your glass negative images. Thanks so much for checking out Willceau Illo news and thanks for commenting! At first when I took possession of the glass negatives from my Dad, I wondered what the heck was I going to do with them. It wasn’t until I started to look at them and figured out how to virtually “print” them that I came to really appreciate them. Stay tuned and watch as Henry Capewell’s story unfolds! I love this. This was on a tumblr post. I love seeing old photos come back to life. I really appreciate this work and I can’t wait to see the rest of the negatives that you put up! This is facinating, what a cool project. Good luck, I will be enjoying your progress! Into old pictures like this. But I can just stare at them for hours! I can’t wait to see more. Thanks again for sharing them. Mike – Thanks so much for the kind words. Joe and I were pleasantly surprised at how well these images came out by just shooting digital pictures of them. Stayed tuned, we plan on rolling out more on Thursdays and along the way,we’ll present whatever new information about these photos and their photographer. Again, thanks so much for taking the time to comment! Cool! I love looking at /studying old pics…they are just so interesting to me…visual history. Thanks for popping over RT! The details of the clothing, and some of the house interiors are really great. Raine, We’re putting a rough timeline together. The photographer’s youngest son was born in 1908. There’s pictures of the children as babies in the collection. That will give you a rough idea. As more info surfaces, I will share. This will be a regular Thursday feature until I run out of material. What a treasure trove you have! I found out about this via Facebook – once in a while a gem pops up there! It is a very good thing to transfer these snapshots of a family’s history to digital form. I have about 200 negatives, and I will be posting about them every Thursday until I run out!